THE WRATH & THE DAWN was everything I wanted in a YA novel -- until it wasn't. 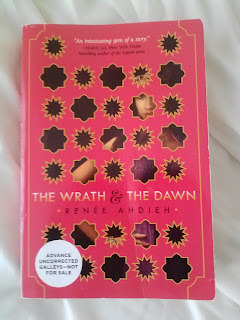 It's a retelling of The Arabian Nights, an underrepresented collection as far as retellings go. Shahrzad, our heroine, pulls a Katniss Everdeen in that she volunteers to marry the caliph, Khalid, who murders his wife each dawn. Shahrzad intends to kill him. Of course, he's way too hunky and mysterious for that to work out. This book has so much potential. Gorgeous setting. Offbeat fantasy. Romance and intrigue. But it just isn't there. The writing falls flat. Even though I was imagining Disney's Agrabah, the descriptions don't support that image -- nor do they refute it. I wanted lush scenery to pull me into the story. I also wanted complex characters. Instead, I got cardboard cutouts: a snarky heroine, even snarkier best friend, a dark and surly hero, and an obsessive knight-in-shining-armor. The plot gets repetitive. Shahrzad wants to kill Khalid. Khalid does something to make her change her mind. Then she convinces herself that his kindness doesn't matter. She wants to kill him. Then he does something and she falters. Again. So on and so forth. And the magic is…weird. It's barely present in the story, so when it does appear it feels out of place. Some people love this book. I didn't. I wanted so much more (than this provincial life).